Do you have some favorite kitchen gadgets that you just can’t live without? I am a minimalist when it come to things in the kitchen. I don’t like junk on my counters (if I could even hide the microwave I would). I don’t like extra stuff in my kitchen drawers, and since I have open shelving in my kitchen, it is important that I keep things simple to keep it clean looking. That said, I do have some kitchen things I just love, some tools that make cooking and baking easier, and some that just make things more enjoyable. Here are just three of those things. This thing has all kinds of names. Some call it the steel scraper, some call it a scraper shovel, scraper-chopper, pasta chopper, pasta scraper, bench shovel, a bash, a scoop cutter. These names are of two similar gadgets, one has a scoop like edge and one does not. 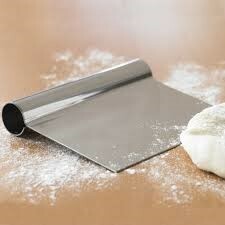 Mine does not, so it works for cutting doughs and scraping off a cutting board, as well as for scooping up chopped veggies and pretty much anything that I cut up. It makes preparing chow-mein so much easier and faster. Mine has a measure guide on the side which is great for keeping things equal, and not having to guess what a ¾ inch cut looks like. It also bashed and smashes. Its strong enough that I can smack a clove of garlic with it instead of the flat edge of a knife. This little tool has earned its spot in the drawer. I use it at least 4 times a week. I don’t know how I used to survive without these things. I use them for so many tasks! They can be used for cutting through meats, and bone. Though most often I use a good knife for that and use them for cutting open packages, cutting up celery, cutting through spring rolls for a toddler, and cutting up tortilla wraps and cheese sticks. I use kitchen shears so often that I don’t even realize until they have sneaked out of the drawer. Tips for your shears, find some that can be washed in the dishwasher. I have a phobia that even though I do wash with super hot water and soap, bacteria might be left on something after cutting meat, so I wash THEN sanitize again in the dishwasher. 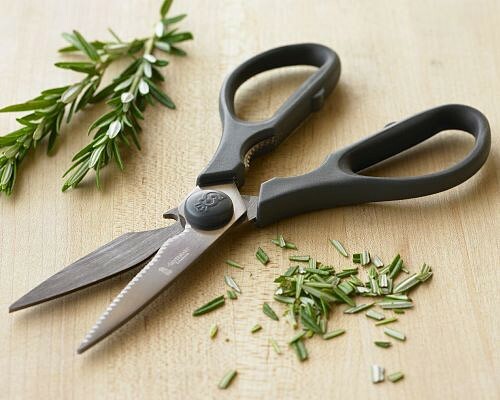 I don’t do this with my knives, but when I purchase kitchen shears, I make sure that the money I spend isn’t so high that I won’t feel bad buying a new pair in a few years. Bonus props when you get a pair that the blades can come apart. They will make so many things easier and more safe. No more cutting open packages and twine with that sharp knife! Preparing fresh herbs is a cinch, that pesky overhanging pie dough? Gone! Whether I am cutting up sticks of cheese, or chopping meats, dicing vegetables… or cutting a hundred other of the things a family cook does in a week. I need a great cutting board. Wood cutting boards weird me out. I am sure I am only one in a million people that have such a fear of bacterial contamination, and I am willing to admit, I probably worry way more than I need to, but that said. I go with plastic cutting boards that I can put through a sanitize cycle in the dishwasher. I haven’t gone to the flexible cutting sheets, but they are on my wishlist. I just have three cutting boards currently and one glass, and don’t see the point in adding one more. That said, I can completely see the ease in one of the bendy cutting mats for transferring food, for storage and for cleanliness. The cost for the new flexible mats are really great, and you can even get them with icons to use certain mats for separate ingredients to avoid that cross-contamination. What kitchen tools are your favorites? Do you have a go to item that you use all the time?